Wabash College is mourning the loss of a beloved friend and honorary alumna, Frances D. "Fran" Hollett H’85, who passed away shortly after 5 p.m. Wednesday. She was 81. Memorial services for Fran will be held at Meridian Street United Methodist Church, 5500 N. Meridian St. on Thursday, April 5, 2012 at 11 a.m. Friends are invited to visit with the family in the church parlor from 9:30 a.m. until the time of the service. In lieu of flowers, it was Fran's wish that memorial contributions be made to: Meridian Street United Methodist Church, 5500 N. Meridian St., Indianapolis, IN, 46208 or Riley Children's Foundation, 30 S. Meridian St., Ste 200, Indianapolis, IN, 46204. Fran and her husband, the late Byron P. "Barney" Hollett ’36, were legendary supporters of Wabash College and gave of their time, talent, and treasure to make Wabash a stronger institution. We invite Wabash alumni and friends to share their memories of Fran and Barney using the "comments" feature below. 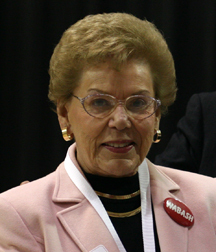 A native of Rockport, Indiana and graduate of Indiana State University, Fran became the first woman ever named an Honorary Alumna of Wabash when the NAWM made her an honorary member of the Class of 1985. At that time the NAWM said, "You are widely known for your enthusiastic support of Wabash and kindness to numerous students." In 2006, Fran was inducted in the Wabash College Athletics Hall of Fame, at which time she was described as "one of Wabash's most fervent supporters regardless of the score." She was active in her lifetime at St. Paul's Episcopal Church, and as a board member of the Shepherd Center and the Indianapolis Retirement Home.